French cellist Toby Kuhn is a post-classical musician with a taste for improvisation and folk music of all persuasions. Always on the lookout for new ways to play his instrument, his unorthodox approach wins admiration and acclaim from a variety of music-lovers, from the concert stage to the pub, from Japan to Slovenia via Sweden and Canada, bringing the full potential of the cello with him on his journey across style and invention. Hannah and Toby met in Summer 2018 at Floating Castle festival in Slovenia. After seeing Hannah perform one of her solo pieces Toby suggested she should keep him in mind if she ever needed a cellist. After a short jam in the Slovenian sunshine it was clear that these two musicians shared a common approach to music making and a real artistic chemistry. Toby Joined Hannah at a solo gig a few days later and a new duo was born! Their music is soulful, original and conversational. 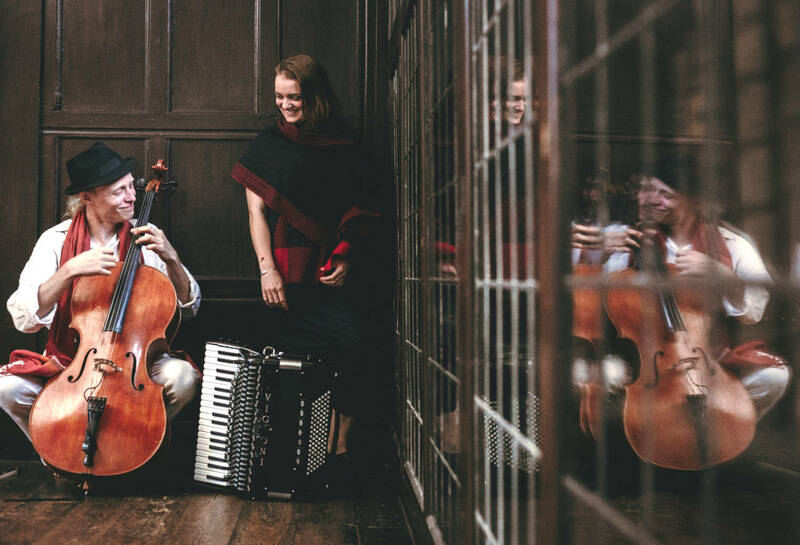 The combination of accordion and cello allows for a huge palette of sounds and textures which lift James’s pure voice and deeply honest songwriting. In the next breath they switch to choppy rhythms and joyful interplay between cello and percussive dance. This duo deliver a diverse, playful and hugely original performance. To read more about Toby click here.